It is late summer, and the season for corn. Hence, it is time to speak of corn in the HBC (and NWC) trade west of the Rocky Mountains. This post is connected to that of last week, as Pere John Nobili wrote that he saw the Indian corn (properly called maize) that grew outside Fort Alexandria in (presumably) 1845 — at the same time that he saw one of the two landslides that occurred near Fort Alexandria. I learned this from a researcher who is researching the Chilcotin horses, and part of his research included the corn that grew around the HBC posts in the New Caledonia district. Why he wanted to also know about corn I do not know. I will discover the reason when his book is published. Through the study of genetics, we know today that corn’s wild ancestor is a grass called teosinte. Teosinte doesn’t look much like maize, especially when you compare its kernels to those of corn. But at the DNA level, the two are surprisingly alike. They have the same number of chromosomes and a remarkably similar arrangement of genes. In fact, teosinte can cross-breed with modern maize varieties to form maize-twosine hybrids that can go on to reproduce naturally. [From: learn-genetics.utah.edu/content/variation/corn/ accesssed August 2016]. Anyway, there is lots out there on Indian Corn. It was first domesticated about 8,000 years ago in Mexico, and 4,000 years ago showed up in what is now the American southwest. In the 1400’s Christopher Columbus returned to Europe with samples of maize. In the 1500’s the first Europeans to arrive on the continent learned how to grow corn from the Indians. It spread north to the St. Lawrence River, probably coming with the Iroquois who moved north to join the Jesuit Missionaries established around Montreal in the early 1700’s, and who later entered the fur trade in huge numbers. By the late 1700’s, corn was part of the North West Company’s provisions. From Carolyn Podruchny’s book, Making the Voyageur World: Travelers and Traders in the North American Fur Trade [U of Toronto Press, 2006]. In all contracts bourgeois were bound to pay the voyageurs’ wages and provide them with equipment. The substance of the equipment and the provision of food and welfare for the engage were rarely specified in contract and thus provided one of the few places for obvious negotiation between the masters and servants. Custom came to dictate that equipment consisted of one blanket, one shirt, and one pair of trousers. Sometimes yearly “equipment” included a supply of tobacco. Rations usually consisted of the food that was available depending on the place and time of year. John McDonell recorded that a voyageur’s full allowance while at Grand Portage in 1793 was “a quart of lyed Indian Corn or maize and one pound of grease a day.” That year voyageurs were only provided with half that amount because provisios had not yet come in by ship. Grand Portage was at the west end of Lake Superior in 1793, and so corn had penetrated at least this far into the provisions of the employees in the late 1700’s. In 1800 Daniel Williams Harmon, who was then at Red River, reports that pemmican was much preferred to Indian Corn by his employees. In 1807 Harmon mentions the Corn was grown at the Sturgeon River post, which appears to be near Nipigon Lake. And at Fraser’s Lake, New Caledonia, in 1815, Daniel Harmon planted Indian Corn! It is probable that Indian Corn arrived in the Columbia district around Spokane House at about the same time as it came to Fraser’s Lake. Having settled that, how the corn was transported around the Columbia District; and how it was grown and used in the district, is what we are interested in today. In 1823, when John Work entered the Columbia district alongside Peter Skene Ogden, he described the corn he found in the boats he traveled down the Columbia River in. Did this corn come upriver from Spokane House, or over the mountains from the east? Sometime before Work’s party had reached the Athabasca River by the old route, his party ran out of provisions. None had been sent to Moose Portage from Edmonton House because of a shortage of food. Work made his way to Edmonton House on foot, where he was provided with provisions on his arrival at the post. However, no corn was mentioned. The only provisions listed in his journal were pemmican, dried meat, and potatoes. Hence, I believe the corn that he saw in the Columbia River boats came up the river from Spokane House. So corn that might not have thrived at Fort George [Astoria] — their old headquarters — was planted successfully at Fort Vancouver, which was constructed (twice) in 1824-5, and in 1831. By now we are talking of the HBC. What do the gentlemen who led out the various York Factory Expresses say? Edward Ermatinger did not mention corn in his outgoing York Factory Express Journal of 1827. On his return journey he received provisions from Edmonton House, which included potatoes, sugar, tea, macaroni, pemmican, dried meat, and grease. At Fort Assiniboine he picked up biscuit, tea and sugar, but again no corn is mentioned. However, they reached Fort Colvile on October 15, and on their departure Boat Number 1 carried 3 bags of corn downriver. At Fort Okanogan they still had three bags of corn aboard, apparently intended for Fort Vancouver. Departing Fort Vancouver in 1828, Ermatinger says that in Boat Number 1 they carried 2 bags Corn among their provisions, and in Boat Number 2 there was 4 bags of Corn and Pease, not necessarily listed as provisions. I presumed at first that the bags of corn that Edward Ermatinger brought downriver in 1827 were planted at Fort Vancouver, and in 1828 made up a portion of their provisions for the first time! But that is not correct. The express left Fort Vancouver in March 1828, leaving no time for the corn to be planted and harvested at Fort Vancouver. I would presume that Indian corn already grew there, in large quantities, and that the kernels (seeds) sent down from Fort Colvile would be planted the next April, to grow and be consumed over the summer of 1828. There is a continued mention of corn in the York Factory Express journals. Generally it is found at Fort Colvile, and in 1831 George Traill Allan saw it there. So corn traveled around in the York Factory Express boats, and obviously in other boats and brigades that went up and down the Columbia River between the posts. It did not appear to come over the Rocky Mountains, nor did I see any sign of it at Edmonton House or elsewhere, but express reached those posts some time after their crop of corn was consumed. In truth, I suspect Indian corn was grown in the Columbia district for many years before we find it in the York Factory Express journals. It would have thrived in the desert-like conditions of those southern posts — Spokane House, Kamloops, and Okanogan. It was probably grown in those places as early as 1815, and perhaps even earlier. The question now is: where did the Fraser’s Lake post get its supply of corn, when the brigade trails did not yet connect New Caledonia with the Columbia River posts of Kamloops, Fort Okanogan, and Spokane? It must have been delivered to them via the old route from the east, through Cumberland House. So, too, perhaps, was the Indian corn that grew in the southern posts. I seem to have asked more questions than answered them in this post — which is probably the way it should be. Research is the result of questions asked, and without asking questions, you cannot learn the answers. An interesting topic! Fort Vancouver reports show significant corn yields, but John McLoughlin frequently commented that it didn’t do well, and would be replaced by peas (usually spelled “pease”). We don’t depend on dried peas much today, but they were a fur trade staple, and the vines were fed to livestock. 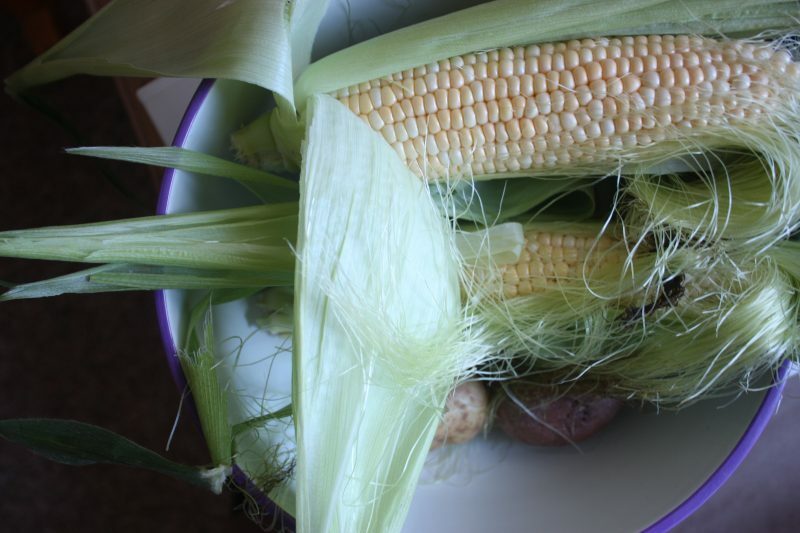 Back to corn: a distinction needs to be made between corn as a “summer food,” called sweet corn today, often eaten on the cob, and mature corn removed from the cob then stored as a dry grain. Dry corn could be ground into meal and then cooked as porridge (or mush, as my father called it), or in corn bread. Or it could be soaked overnight in a mild lye solution (the lyed corn mentioned above) and eaten as hominy. Only mature grain corn will germinate as seed, so northern regions with too-short growing seasons depend on seed coming from points south. Thanks for the additional information. That might help explain why it was transported around the country as often as it was. So part of the corn was eaten, I presume, and the rest saved for seed the next year (in the case of Fort Alexandria). Fraser’s Lake did manage to grow corn year after year, but I wonder if they imported it from Edmonton every year, or saved some cobs for re-seeding. Thinking about that — it probably didn’t like the rain at Fort Vancouver. I am taking a bet it did better in dry climates, than in wet. Corn grows well in a wide range of rainfall, from tropical Guatemala to the dryer Great Plains of North America. Vancouver, Washington’s average rainfall is similar to the upper Midwest of the USA (Illinois, Wisconsin, Iowa) where corn is the main commercial crop. The limiting factor on where corn can be grown to maturity, making it possible to save mature kernels as seed for the following year, is the length of the growing season, a matter of day-length (sunlight) and temperatures. I’m not sure if corn will grow to maturity as far north as Edmonton, by I have my doubts. At the elevation of Fraser’s Lake, even more doubts. They could grow food at Fraser’s Lake, that they couldn’t grow at Fort St. James and Fort George to the south. Fraser’s Lake had a really good climate and a fine farm. Fort Alexandria was the next northernmost farming fort, and it grew wheat, successfully most years.